What’s gone wrong at the Ospreys? 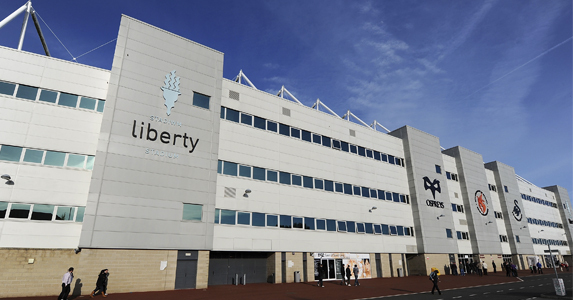 THE OSPREYS’ 22-20 defeat to Munster at the Liberty Stadium means it’s extremely unlikely the defending champions will qualify for the Magners League play-offs. They struggled in the first half against Munster but hit back in the second through the forwards, Alun Wyn Jones touching down from a driving lineout and a penalty try being awarded after a series of scrums five metres out. At 17-13 up, the momentum was with them but they couldn’t close the game out and allowed Ronan O’Gara to slot three late penalties. So why is it that a team with so many talented players is struggling for form? The Ospreys have pointed to the fact that it’s hard to reintegrate so many Wales internationals after the Six Nations – yet Leinster and Munster don’t have that problem. Indeed, this time last year the Ospreys came together pretty well to produce an end-of-season flourish that saw them win the Magners League title. The excuse seems tired. Against Munster, and in some ways against the Dragons last week, they have been shooting themselves in the foot. To give away three simple, kickable penalties in the last ten minutes was naïve at best, stupid at worst. The last one was the most damning, several players creeping offside in their eagerness to charge down O’Gara’s drop-goal attempt and thus giving the fly-half a far more straightforward kick to win the game. A side of this much experience needs to be able to keep their heads and, when they have the upper hand in a game, they must ensure they kill it off – a trait Munster, ironically, are famed for. As it was they allowed the visitors to build some momentum of their own. After the penalty try was awarded, Dan Biggar became involved in a totally unnecessary war of words with Donncha O’Callaghan. All he needed to do was slot the conversion then get ready to attack Munster once more but instead he got hot-headed – surely that isn’t going to help his focus. As for the Ospreys game plan, they often overcomplicate things. There was one incident against Munster when they tried an intricate set of looped passes and switch moves, which came to nothing as they ran out of space. Why not run directly at the opposition and try to bust the line first? As it was, they barely made any inroads on the gain-line. As the mantra goes, you have to earn the right to go wide. Be direct, get go-forward, break the line and then when the space opens up try the fancy things. They also need to look after the ball better. They hardly commit any players to the breakdown in defence and while this means they are set as a defensive unit, it also allows the opposition to get quick ball and build momentum – and reduces the likelihood of a turnover. In attack, when they do have the ball, they can often leave themselves isolated, fling out hopeful passes or again be slow at hitting the breakdown with numbers – all three situations leave them vulnerable to a turnover. A change in tactics and a more clinical mindset must be on the Ospreys’ wanted list if they are to challenge for silverware next season, especially when so many of their big-name players, their game-changers, are departing for pastures new.